Wolf roasted the White House press secretary at the correspondents' dinner. 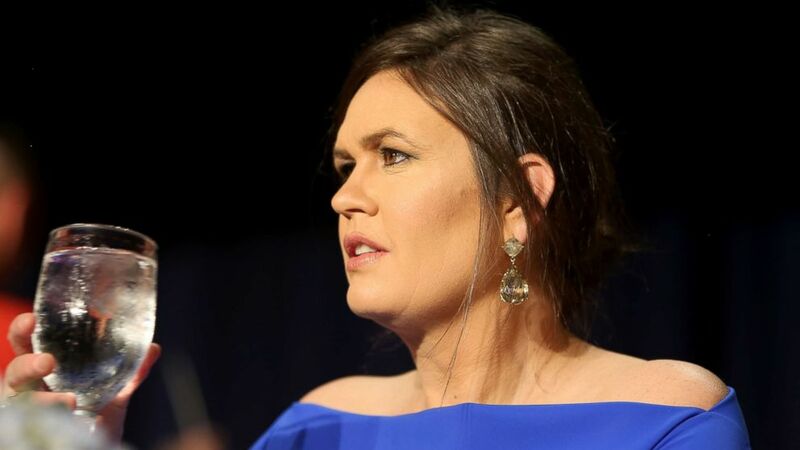 President Donald Trump may have skipped out on the White House Correspondents’ dinner Saturday night for the second year in a row, but White House press secretary Sarah Huckabee Sanders didn’t escape a scathing roasting from comedian Michelle Wolf, the headliner of the evening. "I have to say I’m a little star-struck," Wolf said, directing her joke at the press secretary. "I love you as Aunt Lydia in 'The Handmaid’s Tale.'" Wolf's most controversial jab refers to the fearsome character who teaches the young women to become handmaids on the hit show. Sanders attended the dinner on Trump's behalf, but endured several joke-filled punches thrown her way about both her physical appearance and job performance. "I actually really like Sarah, I think she's very resourceful," Wolf said. "She burns facts, and then she uses that ash to create a perfect smoky eye." (Tasos Katopodis/Getty Images) Sarah Huckabee Sanders attends the 2018 White House Correspondents' Dinner at Washington Hilton, April 28, 2018, in Washington, DC. Invoking the Maybelline slogan, the comedian and former Daily Show correspondent added, "Like maybe she’s born with it, maybe it’s lies." Wolf led her routine by telling the audience of journalists, lawmakers and politicos, "I’m here to make jokes, I have no agenda," but she quickly plunged deeper into a verbal assault on the White House's chief spokeswoman. "We are graced with Sarah’s presence tonight," she said. "Every time Sarah steps up to the podium, I get excited, because I'm not really sure what we're going to get — a press briefing, a bunch of lies or divided into softball teams." Wolf, who has a Netflix talk show set to launch in May, stood only two seats away from Sanders on the dais as she continued to unleash on the stoic press secretary, saying, "I’m never really sure what to call Sarah Huckabee Sanders." She asked rhetorically, "Like what’s Uncle Tom but for white women who disappoint other white women?" Journalists who were in the audience for Wolf's monologue came to the defense of the press secretary they often are at odds with in the briefing room — specifically denouncing the barrage of insults against Sanders' appearance. Maggie Haberman of the New York Times applauded Sanders’ attitude for taking the insults instead of "walking out." MSNBC co-host of "Morning Joe," Mika Brzezinski, responded on Twitter to say, "Watching a wife and mother be humiliated on national television for her looks is deplorable." Wolf responded to both Haberman and Brzezinski on Twitter to clarify the target of her jokes, writing in one tweet, "All these jokes were about her despicable behavior." Adding, "Why are you guys making this about Sarah’s looks? I said she burns facts and uses the ash to create a *perfect* smoky eye. I complimented her eye makeup and her ingenuity of materials." It was perhaps a fearless-yet-vulgar performance for the correspondents’ dinner from years past — and made worse by the absence of the president and his opportunity to retaliate — but responses from both the left and right after the dinner were quick, and immediately showed partisan stripes. Fellow comedian Kathy Griffin, who came under fire for her own controversial attacks on the president, also defended Wolf, who she said was "hired to do a roast." "A comic's job is to go over the line and then push the line and go over it again. Great comics aren't supposed to be safe or careful," Griffin wrote on Twitter. 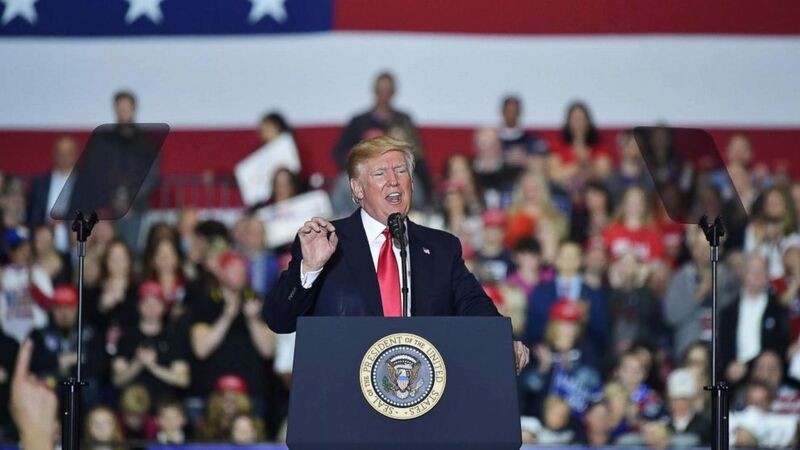 Former senior adviser to President Barack Obama David Axelrod dismissed the debate over Wolf's routine by admonishing the "profane, insult-laden, often inappropriate monologue" from President Trump at his rally. Americans were treated to a profane, insult-laden, often inappropriate monologue last night. But enough about the @POTUS. How about the White House Correspondents Dinner? However, many of the president's most vocal supporters scolded Wolf. Trump’s newly minted national security advisor, John Bolton, called her comedy routine "reprehensible behavior" on Fox News Sunday. "We've seen even last night at the White House Correspondents' dinner, which I was happy not to attend, just reprehensible behavior by somebody addressing the gathering. And sadly it's par for the course in Washington today," Bolton said. Sanders’ predecessor, Sean Spicer, called the dinner Saturday night "a disgrace" and called on the leadership of the White House Correspondents' Association to take responsibility for Wolf’s skewering of Sanders. Former White House Communications Director Anthony Scaramucci told CNN, "It would have been very nice if [Sanders was] given an apology, given what happened." The president, who spent the evening at a campaign rally in Michigan, weighed in Sunday morning to criticize Wolf’s performance, saying the comedian "bombed." (Mandel Ngan/AFP/Getty Images) President Donald Trump speaks during a rally at Total Sports Park in Washington, Michigan, April 28, 2018. While he did not come to Sanders’ defense, he called the entire evening "a very big, boring bust" in a tweet Sunday morning, then later chimed in again Sunday night, saying the dinner should be put "to rest" or "start over." White House Correspondents’ Association President and Bloomberg journalist Margaret Talev responded to the backlash against Wolf, telling CNN, "My only regret is that to some extent, those 15 minutes are now defining four hours of what was a really wonderful, unifying night. And I don't want the cause of unity to be undercut." By Sunday night, Talev further distanced the association from Wolf, writing in a statement to members that the entertainer's monologue did not share in the "spirit" of the evening. The statement did not offer an apology or directly mention Sanders, however. "Last night's program was meant to offer a unifying message about our common commitment to a vigorous and free press while honoring civility, great reporting and scholarship winners, not to divide people," the statement read. "Unfortunately, the entertainer's monologue was not in the spirit of that mission."